If any of you have had the misfortune of asking me what my book was about sometime in the early stages, you probably were subjected to at least a twenty minute discussion that began with, “Well, it’s complicated. . .” An elevator pitch it was not. As it evolved from original idea to first draft to second draft and the many drafts in between, it changed. Since it was my first novel (I don’t really count the couple I wrote in high school), I was learning how to craft a story, develop characters, and get my theme ideas into a plot. We’ll not even discuss all the titles I tried and rejected. Plus, it became obvious pretty quickly that what I had was not one book, but a series. I didn’t just have to figure out how things would unfold in the right order for one book, but six. Oh, and I had to figure out it would take six books. Just to make things that much harder on myself, I didn’t start with an idea at all, but a picture. I read a lot of fantasy, and I came across this painting by Viktor Vasnetnov. I don’t even remember how. I was just so struck by it, I had to know what the creature was, and what was the story behind it. 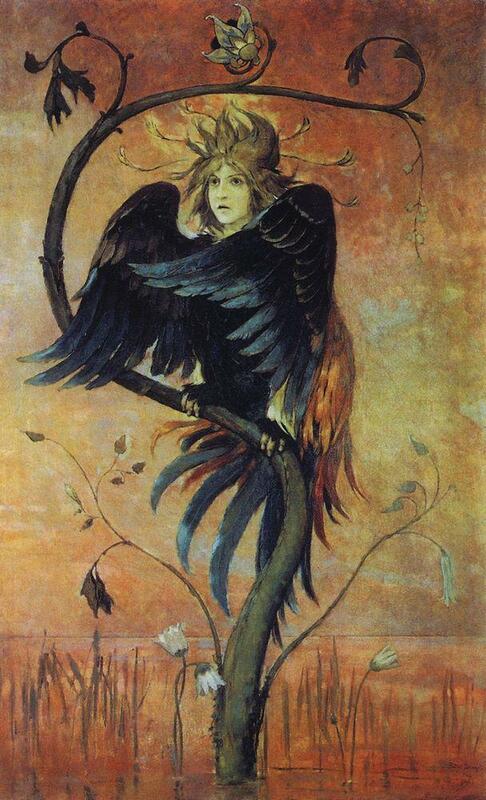 This lead me to the Russian folktale of the Gamayun—a half bird, half woman prophet. There were other characters involved, and as I continued to get ideas, I just kept going back to Russian religious myths to find a wealth of ideas for villains, conflicts, etc. My brain was whirring. I didn’t just want to retell the old stories, though. I wanted to put them in a modern setting and tell them in a different way. Which leads us to today, where I am happy to say I can tell you exactly what my book is about and even the title. It looks like the release date will be in late November. I’ll let you know the exact date soon. But be looking for. . .
Galine Karsavina’s life has always been difficult, but it’s about to get much worse. She already had enough responsibility as both a nursing assistant and her sister Katja’s guardian. But when an embittered and mysterious patient dies in her arms, Galine’s eyes are opened to a mythical world few ever see. With the stranger’s last breath, Galine is transformed into a half woman, half bird creature covered in flame-colored feathers. She has been chosen as the next Gamayun and is forced to be a prophet for a God she doesn’t believe exists. The world of the Gamayun holds only danger for Galine. Forced to shift into her half bird form, she is sent with prophetic warnings to her darker counterpart the Sirin. Oozing seduction and violence and aided by her legions of demon hawks, Sirin is determined to silence Galine by any means. Galine struggles to stay alive and keep her sister and best friend Harper safe, even if it means lying to them about who she really is. Her only ally is Sasha, the guardian of the previous Gamayun. Galine is drawn to him, but he might be safer without her.